SeQuential Biofuels has opened a solar-powered retail biofuels station in Eugene, Oregon this week. The station offers a full range of ethanol and biodiesel blends: E10, E85, B5, B20 and B100. The station features a number of green design features including a 244-panel solar array that covers the fueling islands and a "living roof" consisting of 4,800 plants installed in five inches of soil on the roof of the attached convenience store. The 33kW solar array will provide 30% to 50% of the electrical power that the station will require annually. The “living roof” will help to control rainwater runoff on the site and will help cool the convenience store during the summer. Other eco-friendly design elements include stormwater detention bioswales where plants will filter pollutants from rainwater that rinses the roadways and parking areas and will clean the water before it leaves the site. SeQuential also has made a significant effort to source building materials that are made in the Pacific Northwest region. A portion of the biodiesel dispensed at the station is received from SeQuential-Pacific Biodiesel in Salem, Oregon. SeQuential-Pacific Biodiesel is Oregon’s only ASTM-certified, commercial biodiesel production facility, producing one million gallons of biodiesel per year from used cooking oil collected throughout the Pacific Northwest and from canola oil grown in Eastern Oregon. 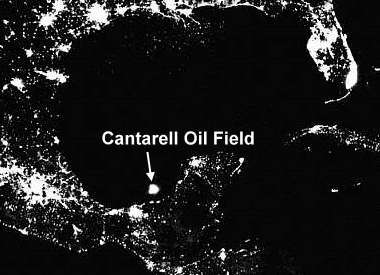 The land where the station is located was the site of a previous fuel station that shut down more than ten years ago. Under supervision of the former owner, the site had been contaminated by leaking gasoline tanks and pumps and the owner had abandoned it. SeQuential worked with Lane County and with the Oregon Department of Environmental Quality to clean up the previously polluted brownfield property and put it back into productive use. The fuel station also includes a convenience store that carries top-shelf natural foods and beverages, many of which are produced by regional companies. The store also houses an annex of Sweet Life Patisserie, an established local coffee and pastry shop renowned for its premium coffees, baked goods and savories, complete with wireless internet and an inviting seating area. Local farmers will stock a seasonal fresh produce stand also located at the station. Founded in August 2002 by Ian Hill and Tomas Endicott, SeQuential Biofuels is a biofuels marketing, distribution and retail company with offices in Portland and Eugene, Oregon. Since its inception, the company has blazed the trail for the biofuels market in Oregon. In partnership with more than 20 regional fuel distributors, SeQuential offers commercial biodiesel/petroleum diesel blends to businesses, governments and individuals at more than 25 retail and cardlock pumps throughout the state. In 2004, SeQuential formed SeQuential-Pacific Biodiesel, a joint venture with Pacific Biodiesel of Maui, Hawaii, to construct Oregon’s first and only commercial biodiesel production facility. The facility began operation in July 2005, and it produces one million gallons of ASTM-certified biodiesel made from used cooking oil collected from Pacific Northwest restaurants and food processors and from virgin canola oil grown in Eastern Oregon. This is great! I've been waiting for this station to open for a while now. Now, whenever I'm in Eugene, I'll stop in to fill up with E10 before the trip home. I'd definitely encourage any of my readers in the Eugene area to check out the new SeQuential station. I hope SeQuential finds this station successful and opens up other stations in Oregon - Portland making the most sense for the next retail station. Well, since I have been too busy these past few weeks to do any good analysis recently, I'll refer you all to an excellent example of what a little bit of simple math can do (ok, more than a little bit, but it's still nothing more complicated than multiplication and division): the Engineer-Poet, over at the Ergosphere recently took aim at Coal-to-Liquids projects, using some back-of-the-envelope math to illustrate how those pushing CTL and citing our vast coal reserves as a solution to our energy insecurity are leading us down the wrong path. "If we are looking for good investments in America's future, batteries look like our best bet. The sign for Fischer-Tropsch is pointing down the road to ruin." U.S. wind energy installations now exceed 10,000 MW in generating capacity, and produce enough electricity on a typical day to power the equivalent of over 2.5 million homes, AWEA announced August 14. A megawatt of wind power generates enough to serve 250 to 300 average homes. The record growth in wind power is driven by demand for the popular energy source and concerns over fuel price volatility and supply. It was also made possible by a timely renewal of the production tax credit (PTC), a federal incentive extended in the Energy Policy Act signed a year ago by President Bush. Previously, the credit had been allowed to expire three times in seven years, and this uncertainty discouraged investment in wind turbine manufacturing in the country. AWEA is calling for a long-term extension of the PTC before its scheduled expiration at the end of 2007 to avoid further “on-again-off-again” cycles and encourage long-term investment. The industry is gaining momentum as it grows. The first commercial wind farms were constructed in California in the early 1980s, and after reaching 1,000 MW in 1985, it took more than a decade for wind to reach the 2,000-MW mark, in 1999. Since then, however, installed capacity has grown fivefold (for a chart showing historical cumulative capacity, go to http://www.awea.org/faq/instcap.html ). Today, the industry is installing more wind power in a single year (3,000 MW expected in 2006) than the amount operating in the entire country in 2000 (2,500 MW). As the U.S. wind energy industry sails past the 10,000-MW mark, AWEA released the following figures and statistics to illustrate some of the economic, environmental, and energy security benefits of wind power development. Supplying electricity: Wind was the second-largest source of new power generation in the country in 2005 after natural gas, and is likely be so again in 2006, according to the Energy Information Administration. Creating jobs: Wind turbine manufacturing companies have recently opened facilities in Iowa (Clipper Windpower), Minnesota (Suzlon), and Pennsylvania (Gamesa), and wind turbine orders are creating jobs all the way down the supply chain, sometimes in areas that do not have a large wind resource, such as Louisiana. Less global warming pollution: Today’s 10,000 MW of wind power are keeping 16 million tons of carbon dioxide (CO 2), the leading greenhouse gas associated with global warming, out of the air every year. That’s equivalent to the amount of CO 2 that would be absorbed by over 9,000 square miles of forest, an area about the size of Vermont. Better air quality: If the same amount of electricity as that generated by America’s 10,000-MW wind turbine fleet were instead produced using the average utility fuel mix, it would emit 73,000 tons of sulfur dioxide and 27,000 tons of nitrogen oxide per year, as well as other pollutants such as mercury. Saving fuel: Today’s 10,000 MW of wind power saves about 0.6 billion cubic feet per day, or about 3.5% of the natural gas used nationwide to generate electricity. Domestic, inexhaustible energy source: America’s wind resource potential is vast—theoretically more than twice enough to meet current U.S. electricity supply. President Bush said earlier this year that wind could meet 20% of the country’s electricity supply (the share that nuclear power provides today). More figures and statistics on the 10,000-MW milestone are available on the AWEA Web site at www.awea.org/10GW.html. A new study by global market research company Synovate shows that 49% of consumers - once the concept of a plug-in hybrid was explained to them - said they would consider purchasing one, roughly the same level of consideration as standard hybrid technology, according to a Green Car Congress (GCC) post. The study, conducted among 1,240 buyers and those intending to buy new light duty cars and trucks, found that while awareness of hybrids is now very high among US consumers, consideration of a conventional hybrid vehicle has flattened at just under 50%. Plugging the vehicle in at home means fewer trips to the gas station and lower operating costs. The unknown with this technology is the additional purchase cost. However, there is a considerable group of consumers who are willing to pay to get these unique benefits. It would also be an excellent way to transfer some of the country’s dependence on oil to the national resources we use to power the electric power grid. We believe it’s something to watch. The study also found that while 37% of US consumers would consider purchasing a Flex Fuel vehicle that runs on E85, more than one-third of those same consumers lose interest when they learn that there is a reduction in fuel economy. Consideration for diesels ran at roughly half the consideration of hybrids. Our data give us strong reason to believe that if manufacturers can meet the emissions requirements of the new diesel legislation, some are going to surprise the market with the products they introduce and the buyers to whom those vehicles appeal, said Scott Miller, CEO of Synovate Motoresearch. The information came from Synovate’s latest semi-annual survey of consumer attitudes toward advanced propulsion and alternative fuel vehicles. There's another summary of the study here, which focuses on the still relatively low awareness of several alternative vehicle/fuel options (most notably, direct-injection diesel). Well, this is good to see. I hope Toyota and others are paying attention to this. And, we more or less have the technology for plug-ins available today (unlike some other oft-proposed alternatives). If as many people are interested in buying plug-ins as are intersted in buying hybrids (and twice as many as are interested in buying diesels), it seems like there is a clear enough market out there to justify bringing at least a few plug-in hybrids to market. And several companies, most notably Toyota, but also Daimler-Chrysler, Honda and even Ford and GM, could probably bring plug-ins to market in just a couple of years. They could easily start by basing their first models on their already established hybrid models. The economies of scale and supply chains are already established for all of the electrical components shared between plug-ins and regular (grid-independent) hybrids, so the only hurdle is to establish supply chains for high-energy batteries suitable for plug-ins. Consumers want them, governments and fleet operators want them, ... I want them ... why aren't any of the big auto manufacturers offering one yet? Get on with it already! That's right, it's now been a whole year since I launched Watthead to discuss climate change, sustainability and the path to a clean energy future. For those of you who are curious, it all began with this post on August 11th, 2005: Start Fighting Global Warming ... Like Yesterday People!" The sentiment expressed in that original post still motivates this blog and it's author: we must act quickly and decisively to cut back global emissions of greenhouse gases to mitigate and stabilize the effects of global climate change, many of which are already underway (two links), and one of the most effective ways we can do that, I believe, is to transition our energy infrastructures - both electricity and transportation - to sustainable and clean sources of energy. I'd like to thank all of you who read this blog, especially those who regularly comment. We're up to about 100 visits per day now, and I appreciate being able to share news and commentary about the exciting and constantly changing field of sustainable energy with all of you. I'd like to open the comments in this post as an open thread to provide feedback, suggestions, and comments about this blog in general. What would you like to see more/less of? What subjects do you enjoy the most/least? What suggestions do you have to improve the content/layout/anything else of this blog? Thanks again to all of you out there. I'd love to hear more comments from those of you who don't regularly leave them. Share your ideas, and let's use this blog as a place for discussion, comment and banter. More on MIT's LEES Ultracapacitors - Is this the End-Game for Batteries? Just about everything that runs on batteries -- flashlights, cell phones, electric cars, missile-guidance systems -- would be improved with a better energy supply. But traditional batteries haven't progressed far beyond the basic design developed by Alessandro Volta in the 19th century. Until now, say researchers at the Massachusetts Institute of Technology. Battery advances, particularly big breakthroughs, are widely seen as complementary to renewable energy technologies, which could benefit from improvements in electricity storage. A major battery breakthrough could also have major implications in the realm of plug-in hybrid electric vehicles whose batteries could be charged partly by renewable energy such as solar or wind. This work was presented at the 15th International Seminar on Double Layer Capacitors and Hybrid Energy Storage Devices in Deerfield Beach, Fla., in December 2005. The work has been funded in part by the MIT/Industry Consortium on Advanced Automotive Electrical/Electronic Components and Systems and in part by a grant from the Ford-MIT Alliance. As I hinted at in the into, I think that carbon-based, high-energy density, long lasting ultracapacitors like MIT's LEES ultracap may be the endgame for battery energy storage, at least for electric and plug-in hybrid vehicles. Ultracaps have very high power densities, delivering great acceleration and performance, as well as taking full advantage of regenerative braking (NiMH and Li-ion batteries typically can't charge fast enough to accept all the energy potentially recoverable during regenerative braking). Additionally, ultracaps are very long-lasting (compared to batteries), can undergo several hundred cycles, last 10+ years, and have typically have no problems with cold-start conditions. Their general weakness is their lack of energy density, meaning they generally have to be coupled with a storage battery (or fuel cell) in any electric drive system. If MIT or someone else can develop an ultracap with the energy storage of a traditional Li-ion battery, that would be a major coup for the electric vehicle industry. And if the resulting ultracap was largely made of carbon - a material available in practically limitless supply - any potential materials supply limitation concerns (i.e. for lithium or platinum or other battery or fuel cell components) would be essentially a thing of the past. Let's hope MIT's researchers can deliver this ultracap (and soon) to a commerical partner for deployment in EVs or PHEVs. [EDIT: Upon closer examination, it appears that this REA article is the same as the one that appeared back in February (and was picked up by Green Car Congress, the Energy Blog and numerous others). It appears that REA's RSS aggregator or whatever else they are using to find posts screwed up (this happens sometimes; yesterday, for example, REA picked up a post from August 9 2005, instead of 2006). Finavera Renewables Limited's wholly owned subsidiary, AquaEnergy Group Ltd., has been successful in its application to the European Commission under the Framework Protocol 6 (FP6) program, RenewableEnergyAccess (REA) reports. As a result, the European Commission may contribute up to Euro 1.37 million [US$1.75 million] toward the deployment of a 2 megawatt (MW) full-scale wave-energy power plant off the coast of Portugal, subject to successful contract negotiations and completion of the internal, formal selection process. According to REA, the proposed power plant will be situated in 60 meters of water approximately 10 kilometers off the coastline midway between the Portuguese cities of Lisbon and Porto. Once successful operation of the plant has been demonstrated, the plant generating capacity is expected to be increased to 100 MW - enough electricity to power more than 60,000 homes. "This award reflects the last four years of work that the team has put into the project," said Alla Weinstein, CEO of AquaEnergy. "With our partners, Dunlop Oil and Marine, Portuguese engineering group Kynamar and Labelec, a division of the Portugal's largest utility - Energias de Portugal (EDP) - we will begin executing our deployment plan once negotiations with the European Commission and the partners are completed." "The Portuguese groups in particular have been very supportive," said Weinstein, "as they see the long term value in building a wave technology industry. It has been estimated recently that the country's coastline contains enough exploitable energy to contribute up 20% of the country's total electricity consumption - a total value of over Euro 5 billion [US$6.3 billion]." "We are looking towards the future where wave power generation will join the commercial realm along with other types of renewables like wind energy," said Jason Bak, CEO of Finavera Renewables. "Recent technological advances are moving wave energy forward to a cost competitive renewable source of electricity. Not only does this award assist us in deploying our AquaBuOY technology at a true commercial scale, but along with our 1 MW Makah Bay project in Washington, USA, we can now start to look at building a pipeline of other projects worldwide." Well this should help kickstart AquaEnergy's wave energy projects, both in Portugal and elsewhere. As Finavera's CEO, Jason Bak, mentioned above, AquaEnergy is also developing a 1 MW project in Makah Bay off the Northwestern tip of Washington's Olympic Penninsula. The funding for their Portugese project will help them prove their technology, and if the project expands to 100 MW, will help AquaEnergy build a supply chain that will bring down their costs and further spur the development of other wave energy projects, including Makah Bay. AquaEnergy's CEO, Alla Weinstein, spoke at the recent Ocean Renewable Energy Conference in Newport on AquaEnergy's efforts, including the Makah Bay and Portugal projects. A summary of that conference can be found here. Portugal seems to be setting itself up as the European proving grounds for wave energy companies, with both Ocean Power Delivery, and now AquaEnergy, deploying their first commercial projects in Portugese waters. Scotland is also competing to become the center of the emerging European ocean energy industry, and if Oregon is smart (and the efforts of local ocean energy boosters pays off), it could become the center of the North American ocean (or at least wave) energy industry. The ocean energy industry is going to be fun to watch over the next four or five years, as a number of companies get their first projects in the water, and try to expand to truly utility scale projects (i.e., in the 10s to 100s of megawatts). This truly is the birth of a new renewable energy industry, and I for one welcome this new addition to our toolbox of renewable energy resources. Research from the University of Birmingham in the UK suggests that by indulging in chocolate, we could be contributing to a new source of renewable energy. Scientists at the University's School of Biosciences have found a way to extract hydrogen from confectionery waste -- a process that could have a major impact on the future handling of food waste and its potential as a supplier of renewable energy. Using E. coli bacteria, identified by the researchers as having the right sugar-consuming, hydrogen-generating properties, a fermenter is set up containing the bacteria along with the caramel-like waste product and a gas such as nitrogen. Under these conditions, the E. coli ferments the sugars, generating a range of organic acids. To alleviate this toxicity in their environment they convert formic acid to hydrogen. Hydrogen is one of the cleanest fuels available and when used to power a fuel cell, the only byproduct is water. The hydrogen generates clean electricity via a fuel cell. Thus, food factories could use their own product waste to generate energy for the manufacturing process; they might even be able to fuel their own vehicles from the hydrogen generated in this way. And it's a technology that could be adapted for use with most forms of food waste, making it internationally applicable. There. Our energy problems are solved... just eat your chocolate! Verdant Power LLC, builder of the first tidal-power project in the U.S., says a competitor is blocking access to prime sites by applying for permits with no intention of developing them. Oceana Energy Co. denies it is blocking development at any of the 12 sites where it has asked for permission to place tidal-power projects. 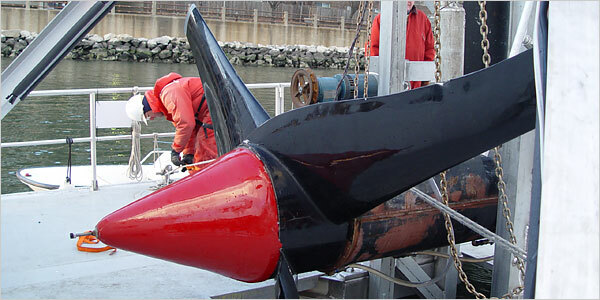 Tidal energy uses the movement of waters in ocean channels to run turbines. Verdant, based in Arlington, Virginia, describes its turbines as "underwater windmills.'' Sean O'Neill, president of the Ocean Renewable Energy Coalition, a trade group in Potomac, Maryland, said it is difficult to sort people who are tying up sites speculatively from those legitimately seeking locations that would be best suited for their technology. He declined to characterize Oceana's activities. In a July 3 filing with the Federal Energy Regulatory Commission (FERC), closely held Verdant compared Oceana's moves to the dot-com tactic of registering Internet domain names and holding them "for ransom." The company said it believes Oceana "intends to bank the sites and auction them off for its own private gain when tidal technology matures." A preliminary FERC permit gives developers three years exclusive access to a site. Oceana will harm development of tidal energy "at a time when large institutional companies are beginning to invest in wave and tidal companies," Verdant said. "These investors most likely will pull their money, with a possible death-spiral effect on this fledgling industry." Washington-based Oceana filed applications with the commission seeking permits for sites in Alaska, Washington, Massachusetts, Maine, New York and New Hampshire. The company already has a permit for a site in San Francisco Bay. Most of the permits Oceana seeks are for sites identified as ideal for tidal power in reports funded by the utility industry's research organization, EPRI. The commission has approved 11 preliminary permits for tidal energy since 2004, according to spokeswoman Celeste Miller. Another 22 permits are pending, she said. Roger Bedard, ocean energy leader for EPRI and author of the EPRI reports, said the number of tidal project proposals has boomed since the reports were issued late last year and early this year. "I think our feasibility study has something to do with it,'' he said. Verdant said in its filing that Oceana is targeting sites identified in the EPRI report and has failed to propose any specific projects or technologies. The company lacks "any reputation in the still relatively close-knit ocean energy community,'' Verdant said. Verdant is preparing to install next month the first tidal energy facility in the U.S. in New York City's East River [previous post]. The test facility will provide 200 kilowatts of power. It could be expanded to 300 turbines capable of generating a total of 10 megawatts, enough power for about 8,000 average U.S. homes. This site banking issue was a frequent topic of discussion at the recent Ocean Renewable Energy Conference in Newport Oregon I attended [see previous post]. Another company (I'm not sure the name) has aparently been trying to file for prime wave energy sites off the coast of Oregon also identified in an EPRI report. This site banking issue could be a real setback for the fledgling ocean energy industry, and is a major concern for legitimate ocean energy developers. One suggestion at the Conference was that the Oregon Department of Energy (ODOE) file preliminary permits for the prime wave sites located off the coast of Oregon in order to prevent speculators from banking the sites. ODOE would then cede the development rights to legitimate developers. I'm not sure if that strategy will be employed to protect wave energy sites from the kind of site banking that has apparently already locked down a dozen prime tidal energy sites. I hope, for the sake of the industry, that Oceana is a legitimate developer with real plans to develop most of these sites in the next 3-5 years. If it turns out that they are simply speculators site banking prime sites, then, as OREC's Sean O'Neill aptly said, they should be tarred and feathered. As Renewable Energy Access (REA) reports, California's solar industry continues to eek out gradual but notable victories this week in the state Senate where solar legislation hasn't historically fared so well. On Tuesday, the reincarnated Million Solar Roofs bill, Senate Bill (SB) 1, passed the Senate Energy Committee with a unanimous vote from all nine Democrats and Republicans present. The bill now moves to the Senate Floor for a final concurrence vote before heading to the governor's desk, REA reports. At the end of June, the reincarnated SB 1 passed the state Assembly with strong support on a 43 to 15 vote [previous post]. The Million Solar Roofs bill, SB 1, contains three main policies intended to accompany the California Solar Initiative (CSI) established by the Public Utilities Commission through a regulatory proceeding in January, after SB 1 ran aground in the legislature last year. The complementary CSI is a $3.2 billion fund providing rebates for a million solar roofs in Pacific Gas & Electric (PG&E), Southern California Edison and San Diego Gas & Electric (SDG&E) territories. The program is the nation's largest and aims to build 3,000 MW of solar power - the equivalent of six large power plants - on homes, businesses, farms and schools throughout the state. 1. Lift the cap on net metering enabling consumers to receive a credit on their electric bill for excess energy generated by their solar system. The current cap is 0.5% of a utility's total load. SB 1 would lift this cap to 2.5%. An estimated 5% is needed to build a million solar roofs in California. 2. Mandate that all homebuilders, beginning in 2011, make solar panels a standard option for homebuyers, just like marble countertops. The bill would also direct the California Energy Commission to convene a proceeding to determine if and when solar power should become a standard feature of new construction. 3. Sets a goal that California's municipal utilities, such as Los Angeles Department of Water and Power and Sacramento Municipal Utility District, adopt their own solar rebate program totaling $800 million. The Public Utilities Commission does not have legal authority over the municipal utilities, so legislation is needed to create a statewide solar rebate program. However, in creating this goal, SB 1 would remove $800 million from the California Solar Initiative originally earmarked for customers in PG&E, Edison and SDG&E territories, covering 80% of the state's electricity customers. Bernadette Del Chiaro, clean energy advocate for Environment California, says the bill allows California to take a step forward toward realizing the goal of building a million solar roofs and making California the "Saudi Arabia of the sun." That being said, however, she was not pleased that including municipalities in the arrangement forced the overall funds to be shifted. "By rolling back the California Solar Initiative by $800 million, SB 1 takes an unnecessary and unfortunate step backward," said Del Chiaro. "The responsibility for achieving the state's solar vision now rests heavily on the shoulders of Mayor Villaraigosa and the LADWP to make sure Los Angeles builds their share of the million solar roofs goal." The hearing was held at the request of the chair, Senator Escutia, and other members of the committee given the significant changes made to the bill since the Committee passed the bill last year. The members who voted to approve SB 1 Tuesday were Senators Alarcon, Battin, Bowen, Cox, Dunn, Duttin, Escutia and Kehoe. Jan McFarland, Executive Director of Americans for Solar Power (ASPv) and the PV Manufacturers Alliance (PVMA), says the bill could return to the Senate floor for its last required vote as early as Thursday, August 10. She says the measure is expected to pass this final Senate vote given strong support for the bill. There is more riding the waves here than surfers, thanks to a growing number of scientists, engineers and investors. A group of entrepreneurs is harnessing the perpetual motion of the ocean and turning it into a commodity in high demand: energy. Right now, machines of various shapes and sizes are being tested off shores from the North Sea to the Pacific — one may even be coming to the East River in New York State this fall — to see how they capture waves and tides and create marine energy. The industry is still in its infancy, but it is gaining attention, much because of the persistence of marine energy inventors, like Dean R. Corren, who have doggedly lugged their wave and tidal prototypes around the world, even during the years when money and interest dried up. Mr. Corren, trim and cerebral, is a scientist who has long advocated green energy and pushed through numerous conservation measures when he was chairman of the public energy utility for the city of Burlington, Vt.
Another believer in the technology is Max Carcas, head of business development for Ocean Power Delivery of Edinburgh. “In the long run, this could become one of the most competitive sources of energy,” said Mr. Carcas. His company manufactures the Pelamis, a snakelike wave energy machine the size of a passenger train, which generates energy by absorbing waves as they undulate on the ocean surface. With high oil prices, dwindling fuel supplies and a growing pressure to reduce global warming, governments and utilities have high hopes for tidal energy. The challenge now is turning an accumulation of research into a viable commercial enterprise, which for many years has proved elusive. No one contends that generating energy from the oceans is a preposterous idea. After all, the “fuel” is free and sustainable, and the process does not generate pollution or emissions. Moreover, it is not just oceans that could be tapped; the regular flow of tides in bodies of water linked to oceans, like the East River, hold promise too. In fact, it seemed like such a sensible idea that inventors started making the first wave of such generators centuries ago. Many operated like dams, trapping water and then releasing it after the tides fell. But they were outmoded with the rise of steam engines and other more efficient fuel sources. Ocean energy had a brief revival when oil prices rose in the 1970’s, and prototypes were tested in Europe and China. But financing dried up when oil prices were low in the 1990’s, and advances in wind turbines and other renewable energy elbowed out tidal projects. These days, wave power designs vary from machines that look like corks bobbing in the ocean to devices that resemble snakes pointing into waves. There are shoreline machines that cling, like limpets, to rocks. Tidal power machines, in contrast, often come in the form of turbines, which look like underwater windmills, and generate energy by spinning as tides move in and out; some inventors also are testing concrete-and-steel machines that lie on the seabed and pipe pressurized water back to the shore. Even big commercial power companies are joining the action. General Electric; Norsk Hydro, a Norwegian company; and the Germany power giant Eon have recently pledged money for new projects or investments in tiny marine energy companies. “It is an untapped renewable energy source,” said Mark Huang, senior vice president for technology finance in General Electric’s media and communications business, which is financing marine projects. “There is no where to go but up,” Mr. Huang said. He added that solar or wind energy should be viewed “as a case study” for the direction marine energy could take. Right now, wave power generators are being tested near the shores of New Jersey, Hawaii, Scotland, England and Western Australia. A long-awaited East River tidal turbine project is to start this fall, and Representative William D. Delahunt, Democrat of Massachusetts, has proposed that the United States follow in Britain’s footsteps to build an ocean energy research center, the country’s first, off the Massachusetts coast. A handful of commercial projects are also in the works, including the world’s first “wave farm,” as the fields of machines are known, being installed off the north coast of Portugal. A field of tidal turbines is also being built off the shore of Tromso, Norway. Britain could generate up to 20 percent of the electricity it needs from waves and tides, according to an estimate by a government-financed group here called the Carbon Trust. That is about 12,000 megawatts a day at current usage, or three times what Britain’s largest power plant produces now. In fact, England and Scotland have become experimental laboratories for ocean energy development. As reserves shrink and the offshore oil business in the North Sea winds down, governments are trying to capture the accumulated knowledge and transform oil industry jobs into other ways of generating energy. One research center here in Newcastle is putting marine devices to the test in a wave pool, and another is deploying them in the roiling ocean off the Orkneys, the low islands off northernmost Scotland. The Scottish government has pledged to generate 18 percent of its energy from renewable resources by 2010. If marine energy replaces the burning of some fossil fuels like coal, it can help reduce overall carbon dioxide emissions and possibly increase the diversity and security of energy supply, said John Spurgeon, a marine energy specialist in the British Department of Trade and Industry. Since 1999, the government has committed more than $47 million to research and development, $93 million to commercialize that research and additional money to bring the energy into the electrical grid, Mr. Spurgeon said. No energy source is perfect, though, and marine energy developers are running into some hurdles. While such generators do not emit smoky pollutants or leave behind radioactive waste, the machines are not small or delicate, and can be an eyesore. To draw energy from the ocean, they often need to be rooted on sea floors relatively close to shore, or mounted on rocks on the shore — places that have not traditionally been used for energy generation. And despite their green-friendly intentions, inventors are finding some of the stiffest resistance is coming from environmental groups. Take the case of Verdant Power, Mr. Corren’s company, which has been trying for years to erect a small field of tidal turbines in the East River — a project that may finally get started this fall. Mr. Corren, the company’s technology director, first developed the turbines as part of a New York University project in the 1980’s and planned to attach them to the Roosevelt Island Bridge. After the school pulled the plug on the project, the design team spent years trying to find a new home. One executive even brought a prototype to Pakistan, but the data it collected was lost when the computers and instruments went missing. Verdant embarked on a new East River turbine project in 2003, but it has taken two and a half years to get regulatory approval for the project from environmental agencies and the United States Army Corp of Engineers. The issue was not blocking the river to boat traffic, or how it would hook up to the electrical grid or even how it might mar the view, because it is mostly underwater. It was the fish population of the East River. “We had eight fish biologists against it, and no one on the other side advocating for clean air” or other environmental issues, said Ronald F. Smith, the chief executive of Verdant Power. “You can see that the regulatory process is extremely biased towards doing nothing,” Mr. Smith said, adding that regulators were worried about complaints that could arise from any new projects. To get approval, the company is installing $1.5 million in underwater sonar to watch for fish around the turbines “24 hours a day, 7 days a week,” and the data will be shown online, Mr. Smith said. Verdant Power executives warn against looking forward to a live “East River cam” that broadcasts the murky mysteries beneath the water. Sonar transmissions look more like fuzzy black and white television, they say, and besides they have seen “very, very few fish” on their visits to the river. Ultimately, Verdant estimates it can generate 10 megawatts of electricity from the East River’s tidal flows — enough to power several thousand homes, though its test turbines will be used primarily to power a Gristedes grocery store on Roosevelt Island. To date, studies on the effect of wave and tide machines on marine life have been sporadic and sometimes bizarre. For example, in one British trial, frozen fish were shot like projectiles onto a piece of metal that was supposed to estimate the effects of the turning blades of marine turbines. Proper testing will involve putting some of these devices where they are not wanted, a problem reminiscent of the wind industry’s battle to construct new turbines. Some leading environmental advocates say that the issue is part of a larger wrenching change being thrust on the green movement. But the potential of marine energy is too strong to ignore. For example, a recent report identified San Francisco Bay as being the largest tidal power resource in the continental United States. “There are tremendous resources for generating power along the northern coast of California,” said Uday Mathur, a renewable energy consultant to government agencies and private enterprises. The biggest hurdle is creating a landscape for development “where these technologies can thrive,” he said, which includes a combination of government involvement, community support and of course the availability of financing. According to Ethanol Producer Magazine (EPM), Toronto, Ontario-based SunOpta Inc. has sold a continuous process system for the conversion of biomass-to-ethanol to Dedham, Mass.-based Celunol Corp (formerly BC International). The demonstration plant is scheduled to begin production by spring 2007. SunOpta’s patented pretreatment and hydrolysis technology will prep and convert sugar cane bagasse and possibly hard wood waste to ethanol at a plant in Jennings, Louisiana. Celunol/BC International has been conducting research and development in Jennings with a small-scale pilot cellulose conversion system at an existing facility where much of the necessary infrastructure is already in place, EPM reports. The SunOpta-designed system will only produce between 1.5 MMgy and 2 MMgy, and to produce much more than that will depend on Celunol’s downstream capacity and proportion of hardwoods to bagasse used for conversion, according to Murray Burke, vice president and general manager of SunOpta's BioProcessing Group. “We’ve been at this quite a while,” he told EPM, referring to recent conversion systems sales in the Netherlands, Spain and China, along with the 30-plus years Burke and his company have spent working toward developing its cellulose-to-ethanol technologies. The Jennings plant would be the first in the United States to use SunOpta's patented process. “It’s just been kicked to a new level,” Burke said. BC International was renamed Celunol less than four months ago, Burke explained, and with four new venture capitalists on board the company is financially well-backed. The list of investors includes Vinod Khosla, founder of Sun Microsystems, who has heavily endorsed cellulosic ethanol as key to the future of transport fuels in the United States (and has kicked up quite a lot of controversy in the blogosphere in the process [that's three seperate links]). The demo system is planned to be on-site in Jennings the first week in February 2007, EPM reports. “Another six to eight weeks after that they’ll be operational,” Burke told EPM, meaning a U.S. commercial demo plant will be producing ethanol from lignocellulosic materials by Spring 2007. Burke said capital costs are “cut to the bone,” or minimized, when a company can utilize existing infrastructure, as Celunol is doing. The cellulosic ethanol industry is still in its infancy, Burke said, equating it to the starch-based ethanol industry in 1980. “With processes changing so rapidly, should we put large investments in things that are changing so fast?” he asked rhetorically. Companies should make use of infrastructures in place where capital costs can be minimized in order to integrate a cellulosic ethanol industry into commercialization faster and more economically, Burke said. Businesses that invest in alternative energy sources and energy efficiency should get increased tax credits, Gov. Ted Kulongoski told advocates of a group promoting hydrogen energy sources, last Monday. Kulongoski, who is running for re-election, told the Northwest Hydrogen Conference that he wanted Oregon to move toward a hydrogen economy, and to become a center for fuel-cell production, according to an AP report. The proposed increase [to Oregon's Business Energy Tax Credit] would cost the state an estimated $6.5 million in the 2009-11 budget cycle but could also translate to more business investment and less reliance on fossil fuels, Michael Grainey, the state's energy director, told The Oregonian. The governor's proposal would increase the maximum tax credit for an energy project from $3.5 million over five years to $10 million over five years. It would also allow companies to claim a tax credit for 50 percent of the project cost, up from 35 percent under current law. Oregon's Business Energy Tax credit has been very succesful at spurring investment in energy efficiency and distributed renewables in Oregon. Kulongoski's proposal would make this key incentive even stronger and would make investing in solar photovoltaics, energy efficient lighting upgrades, solar hot water and other energy efficiency and renewable energy improvements an attractive venture for Oregon businesses. As BP continued working today to shut down the huge Prudhoe Bay oil field in northern Alaska after finding “unexpectedly severe corrosion” in a pipeline, company executives would not say how long they expected the facility to be out of commission. Taking the field off line will reduce domestic oil production by 400,000 barrels a day, or 8 percent — equivalent to about one-third of the amount the United States imports daily from Venezuela. With demand for energy now high and production capacity already stretched, the shutdown raises the possibility that the Energy Department may release oil from the nation’s strategic petroleum reserve. Bob Malone, president of BP America, said in a news conference today that the company “will not commit to a date” for restoring oil production in Prudhoe Bay. But Mr. Malone added that BP will look for a way to quickly get oil flowing safely from at least some of the field, to limit the impact on the nation’s oil supply. The shutdown is the latest in a string of embarrassments for BP, which has suffered from a host of safety, environmental and regulatory problems in recent months, including a large oil spill at Prudhoe Bay earlier this year [see previous post]. Word of the shutdown rattled global commodities and equities markets. In the United States, oil prices rose more than a dollar a barrel in early trading, with the benchmark contract for light, sweet crude delivered next month rising nearly to $77 a barrel. In London, spot prices rose as much as 2 percent on the news, to almost $78 a barrel. Stocks, meanwhile, fell in American trading and slid across Europe. Major indexes in Britain, Germany and France all posted substantial declines for the day. Craig Stevens, a spokesman for the Energy Department, said this morning that oil could be released from the reserve if refiners request it, but that none had done so yet. According to Mr. Stevens, Samuel W. Bodman, the Secretary of Energy, has instructed his staff to reach out to BP and to be prepared if the company or any other refiners ask the department to tap the reserves. If such a request is approved, stored oil can be flowing within 24 to 48 hours, Mr. Stevens said. BP said that inspections of its facilities at Prudhoe Bay over the weekend had found pipeline walls in more than one location that had been made too thin by corrosion to meet the company’s safety standards. In one area, it said, the equivalent of four to five barrels of oil had already leaked out of the pipeline and spilled on the tundra. BP said that spill had been contained, and that workers were in the process of cleaning it up. The company is still inspecting other pipelines and production facilities at the field. So far, BP said this morning, 40 percent of the company’s 22 miles of pipeline in Prudhoe Bay had been completely inspected. In March, pipeline corrosion caused a leak of more than 200,000 gallons of oil, the worst spill since production began on Alaska’s North Slope [see previous post]. The incident raised questions about whether BP, based in Britain, had been properly maintaining its aging oil production network there, which it acquired when it merged with Amoco in 1998. The latest corrosion problem was detected during an inspection that the government required BP to perform after the March oil spill. A “smart pig” examination, using a machine that travels through the inside of a pipeline to measure wall thickness, revealed that the steel had corroded in 16 places to thicknesses less than BP considers safe. Daren Beaudo, a BP spokesman, said that for the pipeline in question, safety standards require that at least 70 percent of the steel in a 3/8-inch-thick wall must be intact. The problems at Prudhoe Bay are also likely to add to the debate about whether to expand oil drilling on the North Slope. In May the House voted to approve drilling for oil and gas in the Arctic National Wildlife Refuge. But in the Senate, where support for drilling in the reserve is not as strong, efforts to pass similar legislation have failed. Last year, an explosion at a BP refinery in Texas killed 15 workers, raising questions about the company’s compliance with government regulations. The company is also under investigation over suspicions that it manipulated propane prices. The US Department of Energy (DOE) will spend $250 million to establish and operate two new Bioenergy Research Centers to accelerate basic research on the development of cellulosic ethanol and other biofuels from biomass, including biodiesel, biofuels for aviation, and biologically based hydrogen and other fuels from sunlight. The centers’ mission will be to conduct systems biology research on microbes and plants. A major focus will be on understanding how to reengineer biological processes for more efficient conversion of plant fiber, or cellulose, into ethanol, a substitute for gasoline. Research Centers will address scientific problems that are inherently interdisciplinary and will require scientific expertise and technological capabilities that span the physical and biological sciences, including genomics, microbial and plant biology, analytical chemistry, computational biology and bioinformatics, and engineering. Using microbes for the capture of solar energy and the subsequent conversion to such fuels as hydrogen. This is an important step toward our goal of replacing 30 percent of transportation fuels with biofuels by 2030. The Energy Policy Act of 2005 (EPAct) calls for the creation of new programs to improve the technology and reduce the cost of biofuels production. The mission of these centers is to accelerate research that leads to breakthroughs in basic science to make biofuels a cost-effective alternative to fossil fuels. The US currently produces about four billion gallons of ethanol, mainly from corn. EPAct requires that by 2012, at least 7.5 billion gallons per year of renewable fuel be blended into the nation’s fuel supply. To meet these goals, future biofuels production will require the use of more diverse feedstocks including cellulosic material such as agricultural residues, grasses and other inedible plants. Universities, national laboratories, nonprofit organizations and private firms are eligible to compete for an award to establish and operate a center. To minimize the start-up costs and significantly decrease the time required for the Centers to become operational, the Centers will be established through renovating or leasing existing buildings rather than new construction. Awards, based on evaluation by scientific peer review, will be announced next summer. The centers are expected to begin work in 2008 and will be fully operational by 2009. The announcement of the Bioenergy Research Centers initiative culminates a six-year-long effort by the DOE Office of Science to lay the foundation for breakthroughs in systems biology for the cost-effective production of renewable energy. 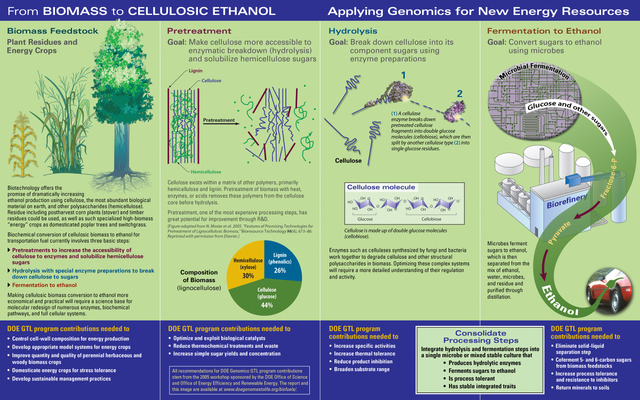 In early July, DOE’s Office of Science issued a joint biofuels research agenda with the Department’s Office of Energy Efficiency and Renewable Energy titled Breaking the Biological Barriers to Cellulosic Ethanol [see previous post]. The report provides a detailed roadmap for cellulosic ethanol research, identifying key roadblocks and areas where scientific breakthroughs are needed. The proposal deadline for this funding opportunity is February 1, 2007. DOE’s Office of Science will provide $25 million in the first year for the establishment of each center and up to $25 million per year for the following four years to support the operations of each center for a total award of up to $125 million per center. I hope that this government-funded research (and hopefully there's more like this to come) serves a supporting role to industry to speed the time-to-market of cellulosic ethanol and doesn't retread the considerable amount of work already done by the private sector. These new research centers will perform 'basic' research on biofuels, which will hopefully yield new improvements to the existing processes for cellulosic ethanol and other biofuels production. And, as with any basic research, it will likely yield a few new surprises. Flexcar is piloting a new program for college students between the ages of 18 and 20 at six universities across the US. The first campuses will include the University of Portland (Oregon), University of California-Los Angeles, University of California-San Diego, University of California-Berkeley, University of Maryland and Emory University (Atlanta). Campus parking for privately-owned cars is typically very limited, and rental car companies traditionally only rent to licensed drivers 25 and older. Even car-sharing, which has been rapidly expanding on college campuses, has been restricted to those 21 and older. Based on the results of the pilot, Flexcar may partner with more campuses in the Fall. Flexcar is already providing car-sharing services to faculty and staff at colleges and universities. Many campuses offer Flexcar as a commuting enhancement service to encourage faculty and staff to leave their cars at home, using Flexcar for personal errands during the day. Other campuses rely on Flexcar for university-related business travel, such as meetings, seminars and other trips. The company is working through the many challenges associated with what the insurance industry generally considers the highest-risk driver group: those under 21. Nonetheless, Flexcar officials feel it is important to extend the personal, environmental and community benefits to this segment of the driving population. Students at these universities must meet certain eligibility requirements in order to participate in the program, including a clean driving record, supplemental insurance and parental approval. They also must pay a refundable deposit. Flexcar operates car-sharing programs for more than 35,000 members in eight metropolitan areas, covering nearly 40 cities in seven states and the District of Columbia. Flexcar’s fleet includes sedans, gas-electric hybrids, and specialty vehicles including pickups, AWD, minivans and convertibles. Rising production costs are squeezing Northwest wheat farmers, according to the Sustainable Industries Journal (SIJ). Across the country, rising fuel and fertilizer costs have dampened the acreage of wheat planted, with more farmers now planting soybeans instead. Wheat growers in Oregon and Washington already face the highest production costs in the country, SIJ reports, in large part because of irrigation demands and land value. On top of these already high costs, rising costs for fertilizer and other costs of production are putting the squeeze on already thin profit margins for the Northwest's wheat farmers. Fertilizer costs have shot up 35 percent in the last year, said Fred Fleming, a founder of the Food Alliance-certified Shepherd’s Grain cooperative in Washington. “It’s a heck of a concern,” he said. Many farmers are facing costs that far outstrip current market prices for their crop, and without change many could be forced to shut down, Fleming said. Many Northwest wheat farmers turned to cooperatives, like Fleming's Shepherd's Grain coop in Washington, for the increased value their product certification programs can provide. But these coops can only grow so big, so fast, and many farmers are being turned away. As an alternative, some wheat growers have applied to put most or all of their acreage into the Conservation Reserve Program, Fleming said. He estimates roughly 250,000 acres of land are being considered for the program, but it only has space for about 8,200 acres. Despite the fact that that Northwest is home to less than 10 percent of U.S. wheat farms, wheat is one of the leading commodity crops in both Oregon and Washington, valued at upwards of $700 million in 2005. So what does this all have to do with energy, you might be asking. 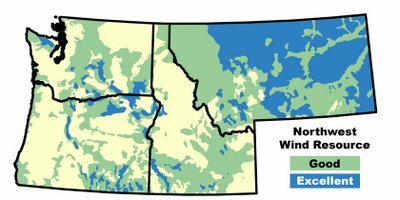 Well, renewable energy development in the Northwest, and wind development in particular, can offer some much needed relief to Northwest wheat farmers and rural communities suffering from the falling profitability of their traditional farm-based economies. In the Northwest, plentiful wind resources abound in the very same rural counties that traditionally rely on wheat and other farmed products, particularly counties bordering the Columbia River in Northeastern Oregon and Southeastern Washington those in Central Washington [see map above]. Wind power development offers farmers and communities in these wind-rich counties a new crop to harvest: the wind. Large, utility-scale wind energy projects can add to a county’s tax base and support essential services such as schools and fire departments. These projects also can generate revenue for individual farmers as well as local and regional businesses. Wind turbines are compatible with farming, occupy little land and can pay farmers many times what they earn per acre harvesting crops. Sherman County is a prime example of a rural community that is harnessing its wind resource and reaping the benefits. 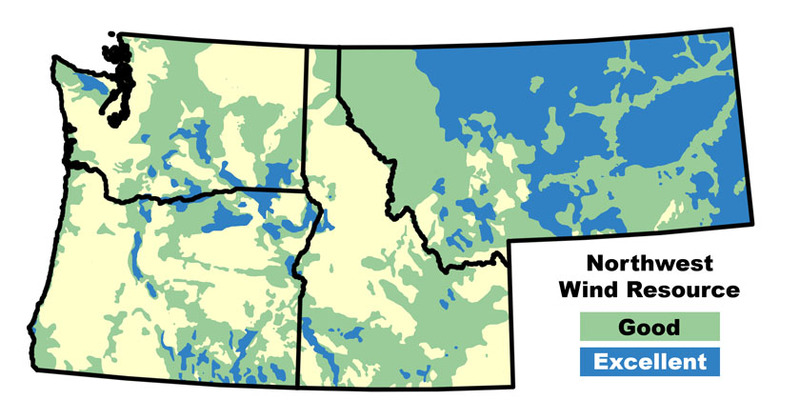 A report from the Renewable Northwest Project titled “Windfall from the Wind Farm; Sherman County, Oregon” details the economic development benefits to the county and to Oregon businesses resulting from the 24 MW first phase of the Klondike Wind Farm. Revenue from the wind farm is helping to diversify this historically single-engine wheat-based economy that is under increased stress from low wheat prices and decreasing harvests. PPM Energy, an energy company based in Portland, Oregon owns the Klondike Wind Farm. The first phase of the project, which came on line in 2001, consists of sixteen wind turbines that can generate up to 24 megawatts (MW) of electricity [see picture above]. A second phase, consisting of an additional 50 turbines, was completed in 2005. The total capacity of both phases totals 99 MW; enough to power approximately 25,160 homes in the Pacific Northwest. The project is located on land cultivated for wheat farming and removes less than 25 acres of land from production. While the physical footprint of the wind farm is small, the economic benefit is substantial. Property taxes generated by Phase 1 of the Klondike Wind Farm has boosted the county's total tax base by 10% and now contributes over $350,000 per year in property tax revenue. This revenue has helped support schools, fire departments, roads and other public services in this cash strapped county. The Phase 2 of the Klondike Wind Farm, which quadruples the size of the original project, is located in an 'Enterprise Zone' and is exempt from property taxes until 2009. At that point, the tax revenue from the Klondike Wind Farm can be expected to roughly quadruple to over $1 million/year, infusing even more money into Sherman County's public services. Additionally, farmers who lease their land to wind developers earn royalty payments that greatly increase the profitability of their farms. Wheat farmers in Sherman County who lease their land to wind developers receive annual royalty payments of between $2,000 and $4,000 for each turbine sited on their property. According to Lee Kaseberg, a local wheat and wind farmer, the turbines are compatible with farming operations. “Put them up, we can farm around them easily,” declares Kaseberg. Wind farms are also capital intensive and infuse money into the local economy. Wind farm construction workers patronize local restaurants, hotels, gas stations and other services and developers often hire a variety of local and regional businesses to take part in the planning, development and construction of the wind farm. Clearly, wind farm development offers rural counties feeling the brunt of increased production costs for wheat and other crops an excellent opportunity to diversify their local economy, tap into another plentiful natural resource, and help keep their farms profitable and their public services well-funded. Renewable energy development in general offers another added benefit. Skyrocketing fertilizer costs making up the bulk of recent increases in wheat production costs, and the cost of fertilizers is largely tied to the cost of natural gas (production of nitrogen-based fertilizers consumes a considerable amount of natural gas). Increased development of renewable energy helps stabilize and even decrease rising natural gas prices as it offsets demand for natural gas for electricity generation (natural gas-fired plants have been the main alternative to wind and other renewables to meet Northwest load growth). This not only helps stabilize and decrease electricity rates - a crucial factor for farmers as electricity prices drive irrigation costs - but also helps stabilize the cost of fertilizers. Thus, renewable energy development offers farmers another benefit: helping to reduce production costs by stabalizing irrigation and fertilizer costs. Clearly, Northwest farmers have a lot to gain from Renewable Energy development. To address the concerns faced by us all - from farmers in Sherman and Kittitas Counties to city slickers in Portland and Seattle - the Northwest needs to make a smart investment in a clean energy future, for today and tomorrow. We must develop our own abundant renewable energy potential - much of it located in rural counties. Renewable energy development keeps money and jobs in our communities, provides a second source of income for farmers and ranchers, and helps build a healthy future for our children. This spring, Pacific Ethanol Inc. began construction of what I believe will be the first ethanol refinery in Oregon, according to an article in Sustainable Industries Journal (SIJ). The facility, located at the Port of Morrow, on the Columbia River, near Boardman, Oregon, is expected to be operational by summer 2007 and pump out about 35 million gallons a year of corn-based ethanol, company officials said. The Port of Morrow facility, which will be modeled after the company’s new Madera, California plant, is expected to provide ethanol for Pacific Northwest transportation markets. Pacific Ethanol plans to sell the Port of Morrow plant’s distiller grains to dairy and feed markets throughout Oregon and Washington. The Boardman and Madera refineries are two of five ethanol plants Pacific Ethanol (Nasdaq: PEIX) plans to construct along the West Coast by the end of 2008. Locations of the other three plants will be announced pending permit approval, a company spokesman said. All told, the Fresno, Calif.-based company aims to increase its total nameplate production capacity to 420 million gallons annually by the end of 2010, SIJ reports. Pacific Ethanol said it will pay for its ambitious expansion plans with roughly $138 million in net proceeds from a May sale of almost 5.5 million shares of its stock to institutional investors, according to SIJ. A portion of the money is also earmarked for investment in promising corn and cellulosic ethanol technologies, a company spokesman said. As I said above, I believe this will be the first ethanol refinery located in Oregon, and certainly the first refinery on a large scale. The Northwest market for ethanol is growing, driven by Renewable Fuels Standards recently enacted in Washington and Portland, OR. However, with the Northwest not really being corn growing country, I imagine most of the feedstock for these facilities will have to be shipped in from the Midwest. So, while ethanol in the Northwest is at least a domestic - in the since of not being imported from another country - it certianly isn't local. The shipping costs to transport the ethanol by rail to the Northwest will also slightly decrease the already marginal improvement in petrloleum and fossil energy use per mile travelled on ethanol relative to gasoline. If Oregon, and the Northwest, truly wants a domestic - as in local - and renewable fuel source, we should be looking to build a cellulosic ethanol industry using waste from the large Northwest forestry and agriculture sectors to produce our liquid fuels (and a bit of electricity) as well as additional electricity from the Northwest's diverse and abundant renewable energy sources to power the electric component of a plug-in hybrid flex fuel fleet. Obviously that's a bit longer term vision - 10-15 years out at least - but something Oregon and Washington should be striving towards.